Kid K’Nex- Creative Play for Smaller Hands! August 8, 2018 August 8, 2018 Abby H.
WOW! We were lucky enough to be selected for a Tryazon Kids K’Nex Play Time Party, and today was the day! The kids had a blast! It was hot already at 10 am at the park, but there were a few kids out, in addition to our guests who came over to check out these awesome toys and play. And for those who couldn’t attend, but want to check out all the fun of Kid K’nex, here is a sweet coupon code TRYAZONKK. It will allow your friends to purchase the Budding Builders Tub for 70% off here. About K’Nex: Founded in 1992, K’NEX, part of the Basic Fun! Family of brands, wanted to show kids that the only limit to building was the size of their imagination! 25 years later, K’NEX prides itself on connecting Science, Technology, Engineering, Arts, and Math with imagination. STEAMagination can be found in every K’NEX set and with it building dreams become a fun-powered, 3-D reality! Winner of over 390 awards and recognitions, the K’NEX product line has building toys specially designed for every age group and skill level. In addition all this fun play, the kids and I gave away two of the KID K’NEX Zoo Friends Construction Toy Sets. Recommended for Ages 3-5 , each set includes eyes, ears, paws, and more! It comes with 30 building ideas in a cool handout, and includes 55 colorful parts! If, you’ve never heard of Tryazon (pronounced Try-uh-zon ☺), Tryazon is a service dedicated to getting innovative products into people’s hands and mouths, in fun settings like the party we had today. They offer excellent product samples and savings for all who participate. We had a great time and can’t wait to party again soon with Tryazon! We received free items to facilitate this event, however we were not financial compensated to hold this event. All opinions are mine solely. Please review our Disclosure Page for more information. July 4, 2018 July 3, 2018 Abby H.
It’s July, and for most of us, Our New Years Resolutions are a thing of the past. Mr. and I were talking today about ways we could reign in our budget. We’re not making it rain by any means, but… we could make a few changes. Here are my top ten tips, and trust me, I’ve already started incorporating some of these. I’ll have all of them back in the works by weeks’ end. Back to meal planning and sticking to it. No more trips to Denny’s when I am feeling lazy in the morning, or Mondays after group therapy. That means I’ll be back to meal planning posts and new recipes too. And I’ll have several “back up dinners” on-hand in case the day gets away from me, or it’s too hot to cook the original meal. I took advantage of the sale on chicken breasts at Smart & Final the other day, and picked up 10 lbs. I came home and cut up the whole half breasts into more manageable sizes, and marinated some of it with different spices and put it in ziploc bags in the freezer. 10 lbs of chicken should get us 5 dinners, plus leftovers from each meal. Back to maintaining a robust snack bag in the car, refilling it daily, and remembering our water bottles when we leave the house. I fill our water bottles (we have these for the kids and these for the adults- in 40 oz) with water and ice before we leave in the AM and refill them as needed throughout the day in various places. In conjunction with #2, start taking surveys on receipts for deep discounts and free stuff again. I am Sonic’s text list, so when they have a daily deal that I have change in my car for, the kids and I stop for .50 ice cream cones, 1/2 price drinks (cherry limeade!). Frequently when you check out, there is a survey on the bottom of the receipt that will score you an XL (Route 44) size beverage for free! I really need to get back into stretching the buck. Check all my apps before I go shopping. I’ve been bad about this over the past few months. I’m sure I’ve missed out on Ibotta deals, Checkout 51 offers, and Cash Dash promos. No More! I’m back, baby!! Allowance. Yup, just like a teenager, I’m putting myself on an allowance, and Mr. is going to as well. I’m sticking to $40 in the summer, and $25 once we are back to school. This will just be for “fun money”. I still shop around for gas to stay within budget for gas each week. Costco is usually the cheapest. Keeping eyes open for cheap entertainment. Big Dude is in ESY (summer school) for the next few weeks, so a lot of the traditional summer things that are fun and cheap we haven’t been able to do (like Regal Summer Movies). We’ve mostly been doing fun stuff at the library, which is free, but I think we need to look beyond that. It’s starting to get too hot for park play dates! I’d love to hear from you about how you combat the frugal slide. What do you do when you feel yourself slipping off your track? We keep to a schedule at our house, even in the summer. I know summer is a time for lazy days, playing it by ear, and fun adventures, but when you have a kiddo on the autism spectrum you need a little structure in your life at all times. Here is a copy of part of our daily summer schedule, I’ve cut off the afternoons as it contains our therapy schedule, as well as lessons/classes. Ok, so first of all, I know you are thinking, “Who the hell gets up at 7:30 during the summer?!? !”, well, us. My kids are usually up by 7:30am in the summer, and that’s sleeping in (ugh, 6:30am, you come too early during the school year). I’ve included the analog clock because the big guy is learning to tell time and it helps him visualize on the clocks in the house. Despite the structure, there is room for creativity and flux. We have freedom in choosing breakfast, what to wear, and there is a 2-hour window of play time, where the kids can do whatever they want: free play, crafts, read a story, watch cartoons. When my buddy was younger, we frequently went without a schedule, and honestly, I was nuts. Just wandering all day without a plan, I frequently had a headache at the end of the day, and would be dreading the next. Now we have a loose overview of what to expect each day, and we fill in our time with free or low cost events. Check out your local library branch- they frequently have fun classes or events. The menu for El Cajon, CA free lunch locations. Pizza and salad twice a week! And for some reason, kids are bottomless pits in the summer, we try to check out some of the free lunches for kids a few times a week. It helps keep our grocery budget in check, but most importantly, it exposes the kids to trying new foods, and new experiences. I try and find out the menus ahead of time and expose the kids to 1-2 new foods per week in an environment where there are peers who already like to eat the “new food”. When kids see peers eating something that’s new to them, often times they try it, even if they may give mom or dad some resistance. I’m not saying that peer pressure is always a bad thing. In addition to free lunches, I try to keep our family snack bag well stocked. I tend to visit Grocery Outlet and 99 Cents Only for most of our snack needs. $25/week is my budget for lunches and snacks for the summer. I try not to set our schedules in stone- We get invites to hang out with friends, go to events, or maybe some relatives will come out for a surprise visit (who knows). We want the kids to have fun over the summer, and I do my best to make sure they get a balance of fun times, learning, and relaxation. I’d love to hear about what you do in the summer: Do you wing it, or have a schedule? 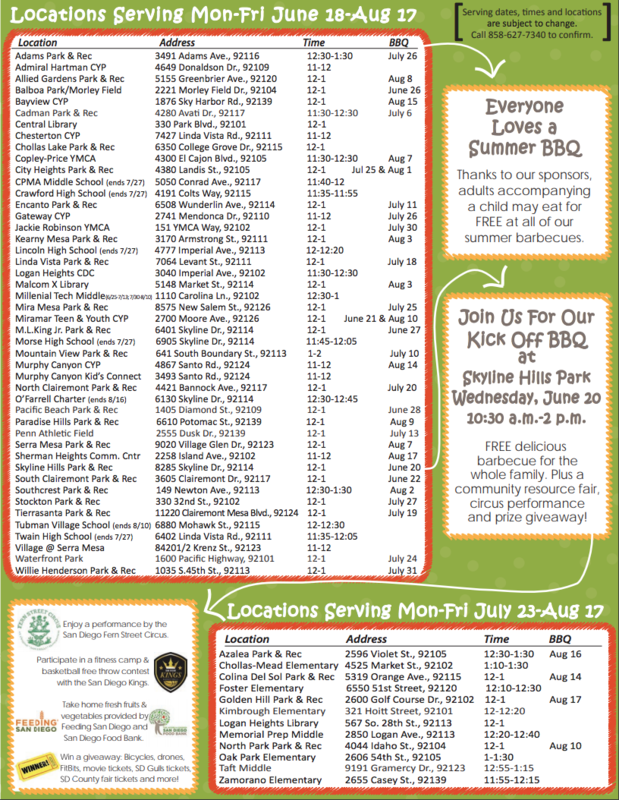 More Free Summer Meals for Kids! June 13, 2018 June 13, 2018 Abby H.
This is an update to this post, which has sites all over San Diego County listed. I just received this in my inbox this morning! Here is a great list of East County resources for free lunches for kids- And many sites also serve breakfast too! We’ll be checking them out in the coming days, and I’ll post pictures (probably on Instagram), so make sure to follow me! Dates vary by location. I am really excited about Hilton Head Park being on the list- That is a great park with a splash pad (only $3 to use for the whole day), shaded picnic tables, and a fun, sandy playground! If you aren’t in the San Diego, CA area and are looking for more information on free lunches for kids, check the USDA website here. THe USDA plans to serve over 200 million meals to kids 18 and under this summer! Free Meals this Summer for Kids! I’m still pulling together resources and lists, so I’ll be posting more resources as they become available. School will be out within a month for most kids in San Diego, and that means there are some parents (and kids) who usually rely on free or subsidized school lunches may find themselves wondering what to do. Thankfully, a lot of great organizations have stepped up and partnered with local area schools, libraries, rec centers, and civic organizations to provide free breakfasts, lunches, and snacks for al kids 18 and under this summer. You can search here for a list of California Department of Education sites that offer free meals (some sites offer breakfast, lunch, and/or snacks). Some Library sites offer lunch too! Here is a complete list of areas that offer free lunches or snacks. Some County of San Diego Library Locations offer lunch or snacks. Here is a filtered list for the month of June. Most libraries have a print calendar each month available that can be picked up with more info. The El Cajon Library on East Douglas has a really great lunch program in the summer with a fun activity/craft afterwards. San Diego Unified School District has partnered with some awesome sponsors to host the Sumer Fun Cafe 2018 all over San Diego County! Lunch will be served at over 30 locations all summer for kids 18 and under! The kick off Summer BBQ (with free lunch for adults too) at Skyline Hills Park 6/20/17 10:30am-2:00pm! There are all kinds of activities too! What I love about this program is that there are tons of rec centers hosting these lunches and they are usually adjacent to a playground, which means after a long morning of playing, the kids don’t have long to wait to get a yummy lunch! Looking for a few ideas of summer fun with a nearby lunch? There is a lunch location down at the Waterfront Park- which is also free! It has a great playground and a splash area. The Tierrasanta Rec Center has a cool kids splash ground that’s open early in the day. It’s not free, but it’s pretty cheap ($2/ kid, $4/adult). 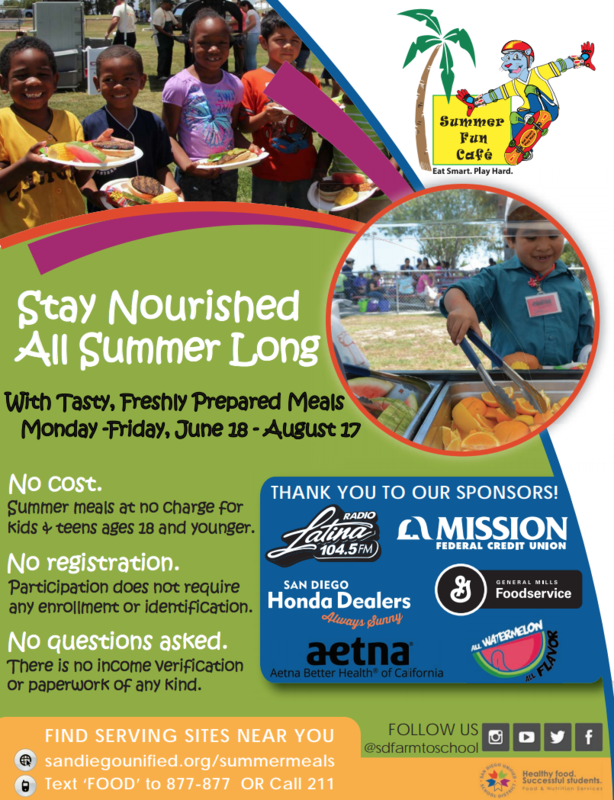 If you know of more summer lunch programs for kids in San Diego County, I’d love to hear about them! Please leave a comment! Free and Low Cost Summer Movies for the Family! May 25, 2018 May 25, 2018 Abby H.
One of my favorite things about Summer Vacation is that lots of businesses and parks get into the fun of summer with free and low cost movies! Regal Cinemas has $1 movies all summer! Each location has a different schedule, but the same movies. Here is the complete list and your closest location. Summer Movies in the Park is an awesome summer long event that takes place all over San Diego County in various city and county parks. There are lots of great movies for kids and families to chose from! Santee Lakes will be hosting Movies and More at the Lakes all summer long! The event is free, but park admission is $10 per carload during the event. If you go in earlier in the day and just play at the park, it’s $6/carload. The first movie is on June 22nd, and it’s Lego Batman! Here is the calendar with all of the events taking place at Santee Lakes all summer! Which movie are you looking forward to seeing with your kids this summer?